When was the last time you evaluated your homeschool? If it’s been a while, you might want to consider taking some time for an evaluation. And guess what? I have some helpful tools to help you as you reflect back on your year. This week I’m talking about things that can ensnare you on the homeschool journey. If you feel like you’re losing your homeschool identity, then it’s likely you’ve fallen into a trap. I’ve thought about the many times that I’ve felt stuck, discouraged, burnt out, or like a dismal failure. And there have certainly been many of those times in these past 6 years of homeschooling. I was able to identify 10 traps that have been major roadblocks in my journey. Are you ready to discover if you’ve fallen into any of these traps? Do you struggle to maintain balance between your roles as wife, mom, and teacher? Is it hard to turn off “teacher mode” and get back into the role of mothering? Or are you having a hard time finding time for your other pursuits? If so, then you have probably fallen into this trap in your homeschool. Are you drowning in a sea of information? Are you finding it difficult to choose what curriculum to use in your homeschool and exactly how you should schedule your days? Are you on overload and burdened by all the choices and advice? Welcome to the black hole that is the information trap. Ouch! This one is a particularly painful trap and it’s so easy to fall in without warning. If you spend time on social media and Pinterest and find yourself full of envy for that almost-perfect homeschool mom you’re reading about – then you might have fallen into this trap. You can also find yourself envying your homeschool friends who seem much more productive and put together than you. Does anyone else enjoy researching and looking through curriculum? I can totally relate! I LOVE when new curriculum is delivered to my door. I find it more exciting than Christmas! However, you have to be cautious that you don’t view curriculum as the most important thing in your homeschool. Your children and their love for learning are the most important. If curriculum has become more important than the process of learning, then you’re probably deep in this homeschool trap. Are you trapped by your progress or your lack of progress? Homeschooling gives such wonderful freedom! You can move at your child’s pace. However, sometimes you can be distracted and focused on the wrong goal. If your goal is to simply finish each curriculum and then continue to move forward, then you might have fallen into this trap of thinking that progress is more important than true learning. Are your priorities properly aligned in your homeschool? At the beginning of each year, you should outline your priorities and make sure that your schedule and curriculum choices revolve around those things. Subjects such as math, reading, and writing should be in the forefront of your plan. If you are spending countless hours trying to line up all your science biographies to perfectly match your history topics each week, then you might have fallen into this trap. If you are stressed about art projects and trying to tie them in to a science unit study while finding a composer to complement the theme and time period, then you are probably deep in this trap. I really don’t know why some people have this vision of homeschoolers sitting around in their homes all day. The reality is that there are so many opportunities available to homeschoolers that we often have to turn many of them down so we don’t overfill our time. However, if you find yourself exhausted and running from one activity, class, co-op, field trip, or park day to another, you might have fallen into this trap. Did anyone have certain expectations or a specific vision of their homeschooler when they were first getting started? I know I had a long list of things that I HAD to do and a list of things that I would NEVER do. You’ll never guess what happened? Many of the things that I thought were vitally important, I’ve since learned are not as important as I thought. On the other hand, the things I said I would never do…..well, I have in fact done many of them in our homeschool (like use textbooks, yikes!). If you are facing down a long list of unrealistic expectations for your homeschool or feeling afraid to let go of something that isn’t working, then you have fallen into this trap. Are you a planner or more of a spontaneous person? Are you organized or the creative, free-flowing type? Introvert or extrovert? Early bird or night owl? If you’ve been trying to fit into someone else’s mold for your homeschool and working against your natural strengths, you have fallen into this trap. As a homeschool mom, I bet you’ve encountered all 3 of them many times. If you are constantly questioning yourself and feeling defeated when others question your homeschool decisions, then you have fallen into this trap. If you feel the constant need to prove yourself and your homeschool success to others, then, yes, you are definitely in this trap. Ok, there’s the list of 10 traps. How did you do? Have you avoided any of them? I’ll be completely transparent and say that I’ve been in all of them more than once. Sometimes I fall into multiple traps all in the same week. However, it’s so important to realize what the traps are and be aware of how easy it is to fall prey to one of them. I’ll see you next week for some more homeschool evaluations! Until then, is anyone brave enough to share which homeschool trap has snared them most recently? Don’t miss any of the posts in my Homeschool Evaluation Series! Ok. I’ve been at this for four years now. I know the traps. Here’s my question: all this blog did was point out the the traps a parent teacher should avoid but not how to avoid them? Sorry you feel that way. My post was listing all the 10 traps so everyone can be aware of what they are. I’m planning some follow up posts for later this summer. So you can find more info later on this summer. This post was only meant to be an overview of the 10 traps. I’m so glad that you’re aware of every possible homeschool trap. My purpose in writing this post was to share the 10 common traps that I’ve discovered with those who might not yet be aware of them. The purpose of this post was to point out the traps to bring awareness. I hope to dive more deeply into the various traps in a later post and talk about ways to avoid them or ways to get out of each trap. But for this post, it would have made it far too long and wordy to include every detail. But thank you for giving me some ideas for future blog posts! I have fallen into all of these traps and am working my way out of them. It’s interesting, because I became a real estate agent seven months ago, and a lot of this is parallel. 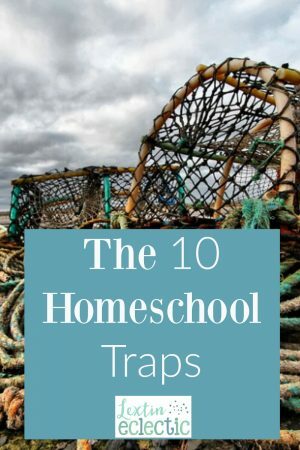 Anything major that becomes a lifestyle change involves traps like these (as I’ve decided to really try to balance homeschooling and real estate, those questions in the last blog were useful for a new real estate agent). Great blog, I’m enjoying it a lot and going to post it. Thanks! Thank you! Yes, I do think a lot of these traps could be applied to other areas. It has really helped me to see where I can potentially fall into a trap – and now that I know the traps I can avoid them the next time.